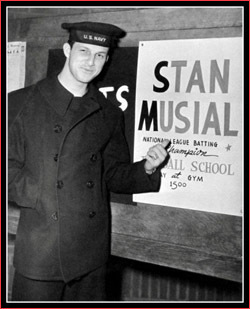 Joining the Navy helped Stan Musial boost his baseball career with the Cardinals. On Jan. 22, 1945, seven months after passing his Navy physical, Musial, 24, was inducted and sent to the United States Naval Training Center at Bainbridge, Md. Musial had helped the Cardinals win three consecutive National League pennants and two World Series championships during the World War II years 1942 through 1944. While receiving his naval training at the Bainbridge facility near the banks of the Susquehanna River, Musial also played for its baseball team. Though he was a two-time National League all-star, a NL batting champion (.357 in 1943) and a NL Most Valuable Player Award winner (1943), Musial learned two important baseball skills at Bainbridge. Musial had played all three outfield positions for the Cardinals. At Bainbridge, the athletic officer, Lt. Jerry O’Brien, instructed Musial to play first base. Stung by the criticism, Musial worked on becoming an adept first baseman. The effort paid off for him and the Cardinals. Musial would play 1,016 games at first base for St. Louis, extending his career and helping the club. The other skill Musial learned at Bainbridge was how to pull pitches with power. Before joining the Navy, Musial’s single-season high in home runs for the Cardinals was 13 in 1943. In 1948, he hit a career-high 39 home runs, starting a streak of slugging 20 or more for 10 consecutive seasons. Popular with the other Navy recruits at Bainbridge, Musial “autographed the inside of the white sailor caps of many of his fellow boots, by insistent request,” The Sporting News reported. Musial was one of three regulars from the 1944 World Series championship team who went into military service in 1945. Musial and outfielder Danny Litwhiler missed the entire 1945 season. Catcher Walker Cooper missed all but four games. Johnny Hopp, the Cardinals’ center fielder in 1944, moved to right field to replace Musial in 1945. The Cardinals reacquired Buster Adams from the Phillies to take over for Hopp in center field. Rookie Red Schoendienst, a natural infielder, replaced Litwhiler as the left fielder. Backup Ken O’Dea took over the catching for Cooper. The 1945 Cardinals earned 95 wins, but finished in second place, three games behind the Cubs, who won eight of their last 10. Musial completed his training at Bainbridge on April 9, 1945, was assigned to the ship repair unit at Pearl Harbor in Hawaii. “I never did learn how to repair ships,” Musial said. In the fall of 1945, Musial requested a leave to visit his ailing father in Pennsylvania. The request eventually was granted and he got there after Christmas. At the end of his leave, in January 1946, Musial was assigned to the Philadelphia Navy Yard. The officer agreed. Two months later, in March 1946, Musial was discharged at Bainbridge. After taking a train to Philadelphia, Musial and two colleagues hitchhiked together to their homes in Pennsylvania. After a week at home in Donora, Musial reported to Cardinals spring training camp and played the entire 1946 season, helping them to their third World Series crown in five years.